Brinnington is a north-eastern suburb of Stockport, Greater Manchester, England. On a bluff above a bend in the Tame Valley, the area is being regenerated, including the demolition of the Top Shops in 2007, which were replaced by new shops, 53 shared ownership houses and First House. In 2009, 17 new homes were built at Lantern Close, a new road named after the annual lantern parade in the area. Brinnington was open farm land before the local authority housing developments of the 1950s and 1960s. To the west of Brinnington is Reddish Vale, a country park popular with families to go for a walk and explore the ponds and brick viaducts; under the arches there is a sharp bend in the river and sand has been deposited giving the effect of a miniature beach. The area consists mainly of council owned dwellings including high rise flats. Brinnington has high crime levels and long-term unemployment at 20%. Two streets, Northumberland Road and Brinnington Road, were named by police as two of the three worst roads in Stockport in 2010. Brinnington is served by Brinnington railway station on the Hope Valley Line from Sheffield to Manchester. The estate is accessed via Brinnington Road, which crosses the M60 motorway at both ends. 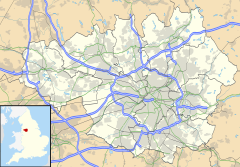 The original proposed Manchester congestion charge would have charged motorists for crossing the M60 motorway, and protests from local residents led to a change in the proposed boundaries, excluding Brinnington from the charge zone. Brinnington has three churches, St. Luke's (Anglican), St. Bernadette's (Roman Catholic), and Brinnington Community Church at the Lighthouse Centre (Evangelical). THere are three primary schools, St. Paul's, St. Bernadette's (Roman Catholic) and Westmorland, the last being an amalgamation of the former Brindale, Maycroft and Tame Valley Primary Schools. Hollow End Towers in Brinnington were the subject of one of the leading cases on the law of nuisance, Transco plc v Stockport Metropolitan BC. ^ Rathbone, Gemma (16 May 2007). "Brinnington's First House is first rate centre". Stockport Express. M.E.N. Media. ^ Latham, Cheryl (14 April 2010). "'Worst' roads in Stockport named by police". Stockport Express. M.E.N. Media. ^ "Changes to city's congestion plan". BBC News. 27 October 2008. This page was last edited on 11 February 2019, at 08:15 (UTC).